Let’s prosecute penniless starving people, that’s what made the UK great right? 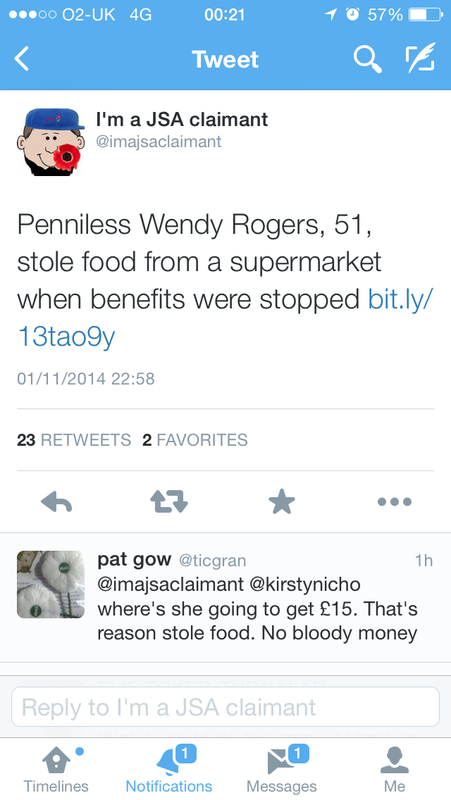 Seeing this tweet this evening and reading the link to the story in the Blackpool Gazette – Benefits claimant stole food from store reminded me of when I got caught stealing food when I was hungry. In a nutshell, I was about 13, my home life wasn’t great, I wasn’t getting enough to eat and I had no money. One day, fed up of always being absolutely starving I decided to steal a packet of biscuits from the local Co op store. I went in with my younger sisterand walked around wondering what I was going to try and take, and at the same time keeping a look out for any shop assistant that might see me. It was a small store and a quiet day. I think it was a packet of custard creams that I decided on. I stuffed them up my jumper and started walking towards the door, absolutely crapping myself that I might get caught. I can’t actually remember what happened except that a shop assistant saw me and we started running towards the door as she shouted loudly for the manager. I was absolutely petrified. I’ll have to ask my sister what happened after that. I think we got caught, put the biscuits back and were told never to enter the shop again. I’m still traumatised by that day now, nearly 40 years later. But I’m more traumatised by the day-in-day-out hunger that I experienced for 2-3 years when I didn’t have enough to eat. Hunger is an awful thing to experience and no one should ever have to go hungry in the UK where we have nough money and resources to ensure that doesn’t happen. So what happened to Wendy Rogers of Poulton, who was penniless because her benfits had been stopped after she took some pork and cream cheese from a supermarket? Rogers was given a 12-month conditional discharge and ordered to pay £15 victims’ surcharge by Blackpool magistrates. Where is a penniless woman going to get £15 to pay a fine if she has no money to buy food? Is Wendy Rogers experience a usual or unusual story? I would love to know what is happening in the UK. I hear tell that the more savvy are stealing larger-ticket items that have enough value to attract a custodial sentence. That way, they get a roof over their heads for a while. Reblogged this on How can I help you today?.